Avery is in the process of earning his Eagle Rank for Boy Scouts. As part of that process he has to lead a large project that will be of some service to the community. Since Avery is so involved with the robotics team in high school, he decided to help the elementary school FLL robotics team solve a problem with their competition tables. The tables are very large and were causing damage to the tables they were being set on at the high school during competitions. So Avery decided to focus his project on adding legs to these 8 tables and building two carts to haul them around. Our neighbor, Jim, generously offered to help Avery design the prototype, plan and build his project with a group of volunteers. The prototyping process took quite a bit longer than anticipated as the tables are pretty large and heavy, so they had to try out several different scenarios. Lucky for Avery and Jim, Bixby was willing to lend a paw and help them figure out the right way to build the cart. The build days arrived and we had 19 volunteers at our house for the first day and 9 the second day. Just enough to get the project done in the time allotted. I was real proud of Avery watching him lead the project and helping each of the volunteers do their part to contribute to its completion. Troy Brown is Avery's Eagle mentor and has been extremely helpful to him through this process. It's fun that the boys are still so connected to Troy since he was also the one who recruited them into scouts way back in the first grade!! He even convinced me to dig in and help a bit which is kind of unusual. I'm not a real big do it yourself kind of guy. Luke also enjoyed helping. He particularly enjoyed drilling and gluing things. Several of our friends from Scouts came over to help complete the tables and carts. The garage became a bit crowded at times, but we had a pretty good rhythm going and were able to complete most everything in the 7 hours of build time Avery allotted for the volunteer portion of the project. We found the glue needed some assistance at times. Lucky for us, Jim is an avid trap shooter and had all sorts of lead shot for us to use to weigh it down. Avery calculated that we drug up 775 pounds of shot up the hill to help us. The tables and carts came together quicker than I was expecting and soon enough the boys were painting the carts. I personally would have chosen a much flashier color than gray, but nobody asked me. Thanks to all the volunteers who helped make Avery's Eagle Project a success! Even Grandma Linda pitched in and helped prepare food for one of the build nights. Thanks, Grandma Linda!! 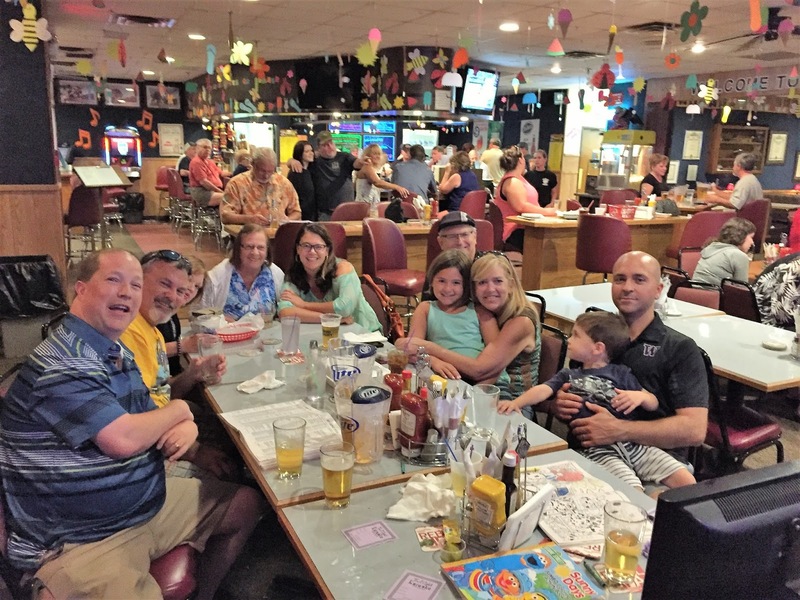 On Friday night, we connected with our good friends, the Walters Family, and met many of their extended relatives. We then sang karaoke for them and probably made them very nervous to be sitting at the same table as us. 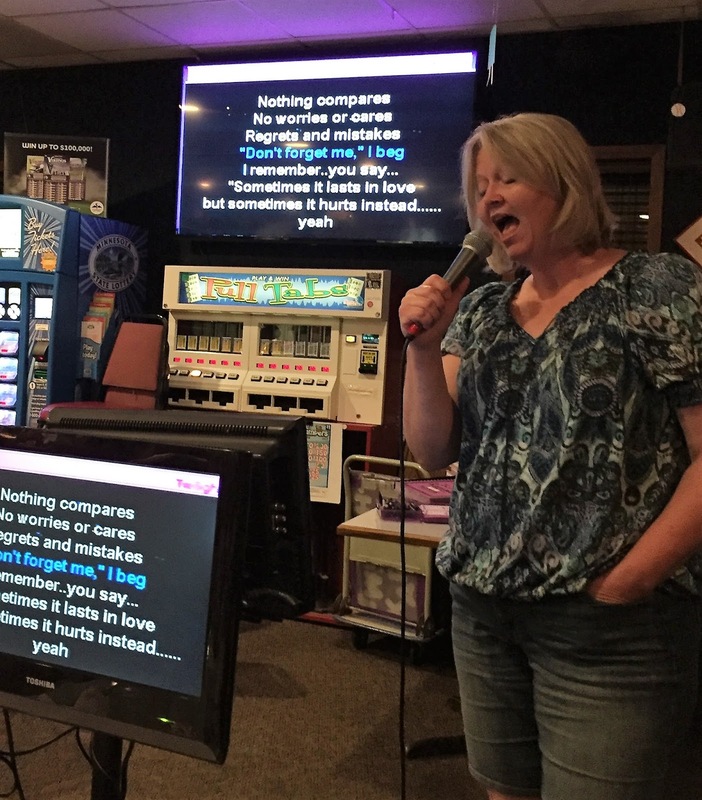 Well, maybe Miss Sheri didn't make them nervous, but she doesn't scream into the microphone as much as I do. On Saturday morning, we had the opportunity to go and watch Conner Walters play goalie during the U13 state lacrosse tournament. Conner was a star getting at least 7 saves while we watched him and his team win the match 3 to 2. Way to go, Conner!! It was my 46th birthday on Wednesday night. Let us never discuss this again. 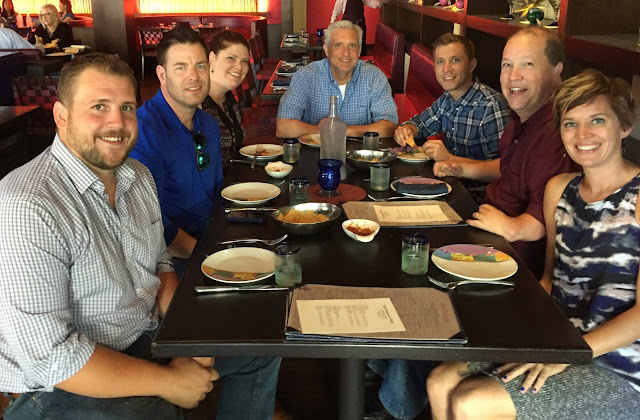 My co-workers were very nice and took me out for lunch on my birthday. They're such good people. 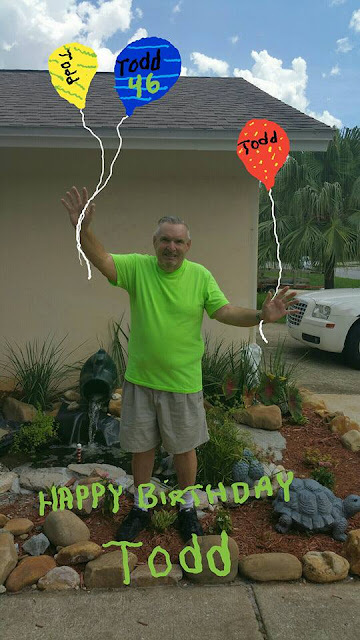 My friend, Bob Berning, sent me this birthday photo he created. I thought it was excellent! Luke stayed busy this week helping the robotics team volunteer for the community auto show in downtown Prior Lake. They built a wall, but I'm not sure who paid for it. On Saturday morning, I drove to Clear Lake, Iowa. I went there to see my old buddies and have some fun playing golf. Unfortunately, it rained off and on throughout much of the day. I was pretty fussy about playing in the rain, but Krazy Kory and Ron didn't seem to mind it much. Ron told me he didn't mind playing in the rain because he has waterproof shoes. I gotta get me some of those. The second my socks became wet, I wasn't having much fun any more. Even though my wet feet were bothering me, I did have one of the best shots I've ever had in my life on Hole # 8. This is the closest I've ever come to a hole in one. It sure looked like it had a chance when we were watching it from the tee box. I'm happy to say, I did hit the birdie so that made me forget my soggy toes for a little while. The rain slowed us down a bit so we were only able to play 18 holes, but they were a fun 18 holes to be sure. The rest of the night we visited several bars & restaurants in town to catch up on old times. We also stopped in to see some old friends like Dennis & Marcia Anderson. We spent a lot of time at their house when we were in high school, so we thought we'd stop in and catch up with them. They were good. They had a 17 year check-up with their pediatrician, Dr. Foslien. She has been their doctor since they were born and Luke is finally taller than she is! On Saturday night, they had a bunch of their friends from the robotics team over for a party to celebrate their birthday. The HTC Vive virtual reality system was pretty popular with this crowd. Shocker I know. We also had the joy of going to another graduation party, this time for Thomas Zwinger. He will be going to UW Madison this fall to become a Badger. Best of luck to you, Thomas! On Sunday, we went to Afton, Minnesota to go for a boat ride with the Zitzewitzes. We heard the river was really high because of some recent storms up north, but we were shocked at how high it was when we got there. We sure do like hanging out with Karl and Tina. They're such happy people. We were excited to try out the new Splash Island pad Karl got for his birthday. I was pretty impressed with it when I saw that it could support my weight without sinking. That's some quality foam there. But the thing I was most excited to do was going for a kayak ride through the woods on the shoreline! We all took turns checking it out. When the river gets way high, it gives us an opportunity to navigate through the trees which is pretty surreal to go through a place where people don't normally get to travel. There's normally a little stream flowing under this bridge. It's a bit bigger right now. We've never been able to go to the other side like this, so it was a special treat for us. The turtles seemed to be pretty excited to see us. Suddenly things started getting a lot scarier so we decided to get the heck out of there. It felt good to get back to the safety of the boat. It was another great day on the St. Croix River! This video features clips from two days of whale watching we did in Monterey Bay in early July, 2016. The first day was on the Sea Goddess out of Moss Landing, California and the second day was on the Monterey Princess out of Monterey. The whales we saw were Humpbacks and Risso's Dolphins. There are also some common dolphins featured at the beginning. On our last night in San Francisco, we stayed at the downtown Marriott and got a room on the 38th floor. We could see all over the place. We waved at the helicopter pilot, but he was kind of rude and didn't wave back. Must have been having a bad day. We ate breakfast at Sears. I had 18 of their little pancakes and could have probably finished a 19th one had they have given it to me. We hooked up with Miss Sheri's cousin, Mary Parker, and her family. They used to live in Minnesota years ago but now are California kids. Mary brought along her husband, Michael, and kids, Catherine and Nicholas. We hadn't seen the kids since they were little so it was great having the chance to spend some time with all of them again. Since they are locals, we thought they could show us some of the sites like Chinatown. It was an interesting place to visit. We were traveling as a group and decided to walk through the rest of town and ended up at Fisherman's Wharf again. We hit Ghirardelli Square and ate sundaes which were absolutely sinful. Chocolate is naughty. Tracy snuck off with Mary to a nearby wine tasting. Mary & Michael impressed us with their knowledge of the local wine scene which is very good knowledge to have. Since it was so close to the 4th of July, Fisherman's Wharf was crazy busy. But it was a good crazy. Like you found yourself preferring to stand in the middle of wall to wall people. We stopped at a gallery and were blown away by some of the pieces on display. This chess set had a price tag on it of $660,000. For a chess board. I don't care how good my game becomes with an expensive board, I just don't see how it is worth it. It was time for us to go back to the hotel and pack for the airport, so we took one of the San Francisco trolleys back. I've never had a craving for Rice-A-Roni like that in my life.